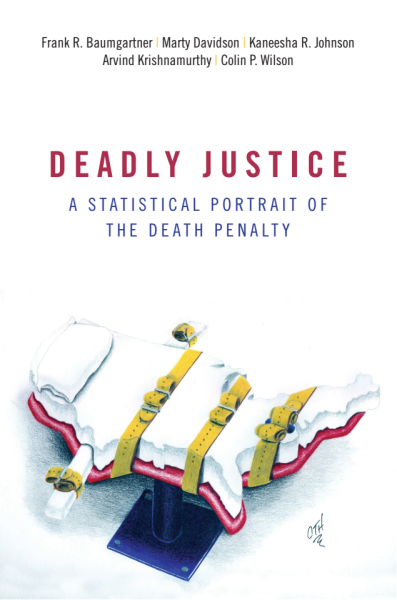 My first co-authored book entitled Deadly Justice: A Statistical Portrait of Death Penalty is forthcoming through Oxford University Press. The lead researcher for the book project is Frank Baumgartner at the University of North Carolina at Chapel Hill. The other co-authors include myself, Kaneesha Johnson, Arvind Krishnamurthy, and Colin Wilson. For more information about the book and media articles related to our work, please visit our book's website. Here. To order the book online, please visit the publisher's official website. Here. National Coalition for the Abolition of the Death Penalty (NCADP). February 2018. Webinar Series on Deadly Justice. This book project was commissioned in direct reaction to Justice Breyer's call to action in Glossip v. Gross (2015). It appears that circumstances have come full circle as Justice Breyer has recently cited our work in a dissent accompanying a grant of cert denial (Tim Evans and Richard Gerald Jordan v. Mississippi). Here.